Light pollution or sky glow is caused by light aimed directly up into the sky and by light reflected off the ground or objects. 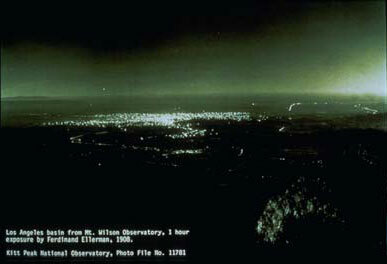 Sky glow prevents the general public and astronomers from seeing the stars. Floodlights, wall packs and other un-shielded luminaires are the major contributors to sky glow. Overlighting, even with shielded luminaires, reflects unnecessary light back into the atmosphere and adds to the sky glow. This often occurs at outdoor areas such as motor pools and sports fields. To minimize light pollution, use fully shielded luminaires or IESNA full cut-off type for area and roadway lighting as illustrated in Figure 3. Figure 2. 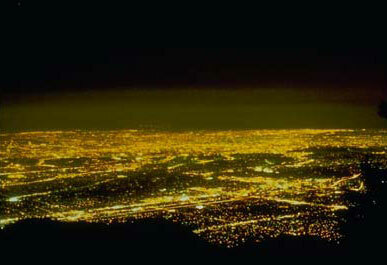 Unshielded and non-cutoff luminaires lead to light pollution. The use of full cutoff luminaires may reduce uniformity and therefore require greater pole heights or spacing. Cutoff, semi-cutoff, and non-cutoff luminaires may also be used at low mounting heights if the lumen output of the lamp is limited to 4200 lumens. These applications, such as pedestrian and entry lighting, typically require greater vertical illuminance for facial identity. Provide uniform low glare lighting and do not overlight exterior areas. Also, control lighting with time clocks, photocells, and motion sensors such that lighting is only energized when needed. This is great information. I thought that no one cares about Light Pollution. For expample, here in Serbia if it were possible, you could urinate in the sky. This is something that should be regulated by law, when there is already a solution. First picture shoud be from LA in 2008 year probably not from 1908 bacause Nikola Tesla was not there !!! Danilo, I live in Serbia also and i think that there is preety dark and without extreme sports like ***** in the sky. Turn of the light . . . .